I have Kennel Club registered siberians. Some of my dogs are NTHC. (Norwegiian sled dog champion). This is a champion title that has been created newly. 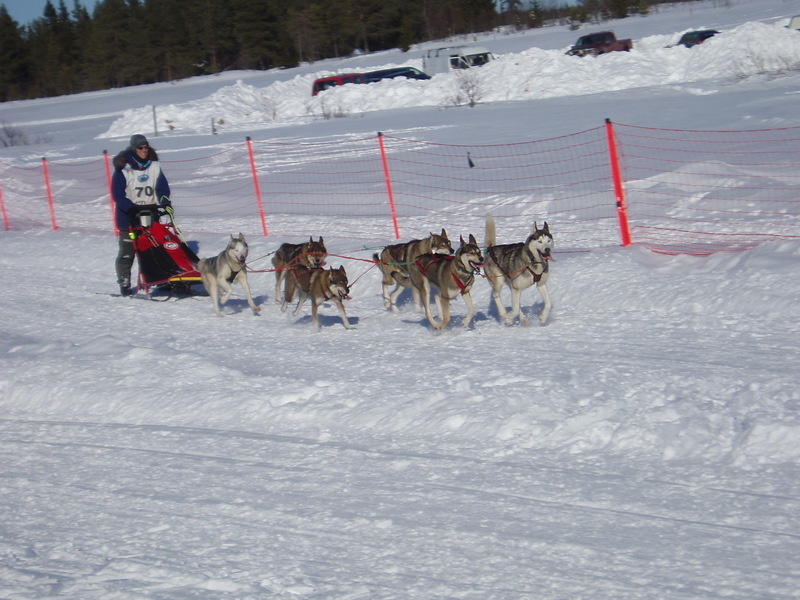 The main part of it is the demonstration of dog mushing ability. They must, in order to get this title, get a good time – calculated from the winner time – in three separate races. Long Distance, Mid Distance or Short. In order to get to that, they must have been trained for months and months. They need to be on an all siberian team, meaning you need not only one goood dog, but many good dogs. And of course, there are good days and bad days, stiff competition and relaxed competition. It takes a while to gather three “first ratings”. And in addition, they need to have at least VERY good on a dog show after being an adult. I don’t often og to dog shows. My spare time is limited, and taking care of a team of dogs is time consuming. Dog shows cost money, and there is a LOT of waiting until youu get your five -ten minutes in the ring. Dog races also cost money, but then you get to be with the dogs for hours or days. I observe a lot being on the sled behind my dogs; little things that are useful. Movements when agile and when tired, abilities to solve problems, sociability, endurance, appetite, focus. Valuable knowledge for me. In the show ring, the judge may be an allround judge that has never been on a dog sled nor knows what to look for iin a good sled dog. He may have a good eye for build and movements, or he may never really have seen a well built sled siberian, as most of what is shown in dog shows are not good perdformers in the races. He probably is socialized into “what usually wins”. A few have been exposed to the dilemma we have. So when I go for shows, and I do, because I have respect for what it is to have a registered dog, I chose show judges that are kknown to appreicate and know the background of working siberians. So most of my dogs are within the standard according to the show results I have. I have Excellent and Very Good on quite a few. Standard siberians, good type. Not show dogs, but honest working dogs in good condition. A few are too tall, and thus cannot get a rating. Some SH dogs grow to become tall, regardless of what you do to try to keep size. They are excellent sled dogs, but can never be NTHC. That’s okay. They have other qualities. I think that siberians are and should remain sled dogs. Thus, the most excelllent types among them, the Champs, should be able to demonstrate dog sledding capability Beyond just pulling a sled slowly for half hour. 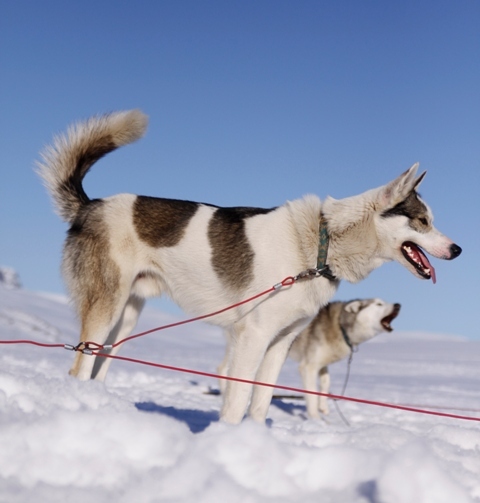 Sled dog champions are typical representatives of what I look for in a SH. But the show world is a world of its own. Showing dogs is not always something you do to confirm or improve the quality of the stock. Ideally, shows should only look at the dog’s conformation as it is from nature, and not a “polished, created and specially trained show babe”. It should appreciate dogs of quality. But this is not the realiity. Human Vanity rules in many shows. Winning throphies becomes the goal. Only dogs that win are of value. In the worst cases, there is envy, corruption and heresay. Dog shows are an inherent part of the Kennnel Club hierarchy. This is an arena for making money and gaining prestige. . If the system makes it attractiive, and even maybe obligatory, to be a show winner, puppies of this kind may be sold for more. If the organization builds up a system of dog show as the most attractive dog actiivity, they cash in entrance fees that pay for the work they do. Or give profit. Dog show judges have no formally recognized neutral education, they are trained and socialized within the system. Sometimes, when judges with alternative, iindividual views enter the scene (Grønaas in Crufts), there is an outcry. Some judges that judge outside the “norm” may not get any new appointments. Many dog owners have seen and commented the not so bright side of dog shows, the way some dog breeds change because of judge preferences. It is worth discussing. In my breed, SH, most of the dogs that I have observed winning in the show rings of ordinary judges, are pretty and sweet, but not cappable of running long races. Thus, SH owners that have show as their main dog activity, breed for what they assume judges will or do prefer. And that is prety far from what I, as a sled dog driver, look for. Is that so bad? Well, there is a liimited number of siberians. The abiliity to be a good sled dog is limited in the breeding stock. Dog sledding is dominated by unregistered dogs, very nice athletes bred for perfomance only. So that is why my plea is a bit strict. I don’t want to interfere with what people do or want for their own dogs. If you want to run around in show rings, do that. If you want to do dog races with siberians in specific races for siberians only, do that. If you want to compete in open races where the competition is hard, do that. But I am not willing to give up the idea that the siberian should be a sled dog. Therefore, I don’t want the system to give any Champion title to a siberian that has not demonstrated that he can race well. This also goes for show Champions. Will it give us fewer Champs? Probably. Will the looks of the champs change? Hopefully, to a better representation of the standard of a typical working husky. But the Champs will also be true representatives of the breed we are involved in; a Nordic breed with its specific looks and working ability. Even those who buy one siberian husky for family dog do soo because they want a dog thhat can work, and they expect it to be able to. I do NOT accept that owners claim that their dog “does pull”. You can nor claim anything about how well it works in harness until you put it to the challenge of a competition.